Crews Letter #2008 11 A Loose Part? Few things are more disturbing to the maintenance officer on this boat than a small piece of hardware that appears to have slipped out of place. 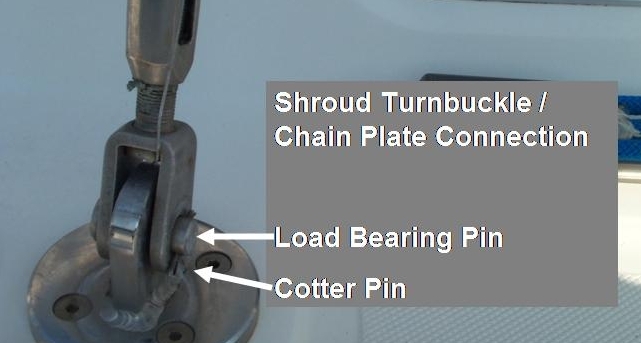 Yesterday, Phyl found a cotter pin on the port deck, just aft of the shroud chain plates. We walked the deck checking every connection at eyelevel or below. Fred went to the first spreader looking for a place to put it. Today, we dismantled the boom, same search. We hired a younger, lighter man to send to the top of the mast, same search. 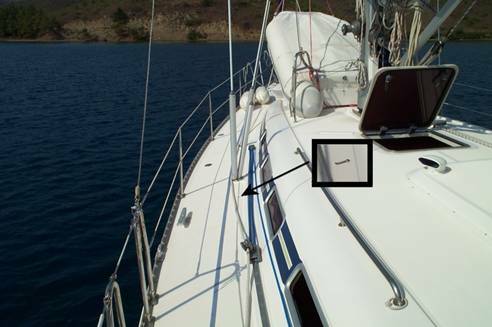 A normal construct on a boat is a pin holds two load-bearing things together. A cotter pin holds the pin. Somewhere on this boat there are two load-bearing things flying looser than usual. Not a comforting thought. An after thought: Next time the crew on the boat beside yours in the marina party late and loud or make disparaging remarks about Eileen Quinn or Jimmy Buffet, put a used nut and washer on their deck. Just a thought.